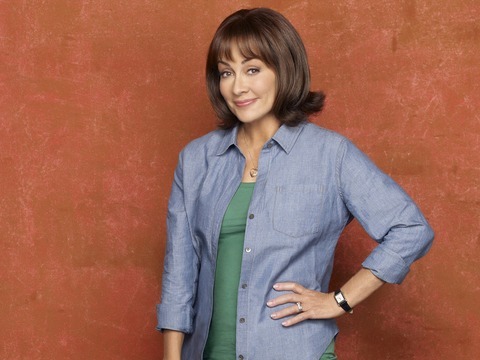 Patricia Heaton: Fun episode for the family, and Betty White guest starred. Enough said! PH: This was based on a true life experience of mine. PH: Brick/Frankie funny episode about Mother/son relationship. Who doesn’t want to run errands with their Mom? PH: Fun episode about Frankie and Mike being rebellious parents. PH: The Hecks get the heck out of Orson. PH: The Mother’s Day gift of Frankie having a day to herself turns out to be disastrous and hilarious. PH: Frankie runs away from home and spends time with her Mom. PH: Hilarious. I laughed out loud when I read the script. PH: Frankie contemplates a new career. What working mother hasn’t? PH: Everyone loved the “Fame” dance. 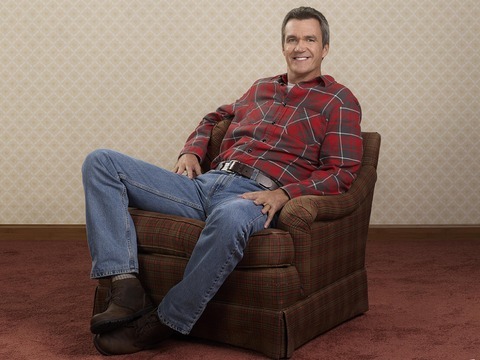 Neil Flynn: Brick tries playing on a basketball team. NF: We meet Sue’s boyfriend, Brad. NF: The family plays football in the street, and Aunt Edie works at the quarry. NF: Axl is hurt by a break-up, he cries as Frankie consoles him. NF: Frankie plays a tape of Mike crying on the phone. NF: Sue graduates middle school. NF: Car ride home from Aunt’s funeral. It was a long opening scene in the car. NF: The killer rabbit is loose in the kitchen. 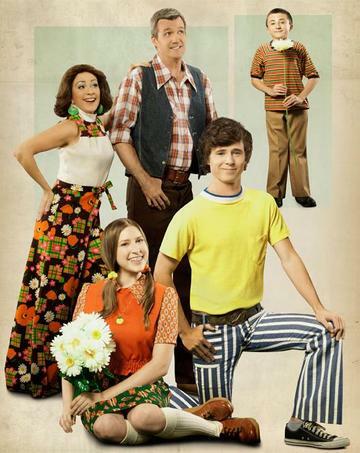 NF: The kids plan an anniversary party, but Sue does all the work. The kids were all great in this one. 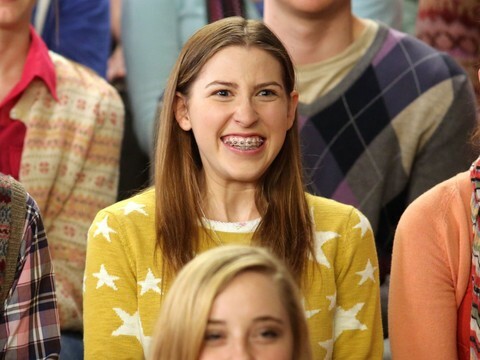 Eden Sher: Beginnings are always the most exhilarating. Doing a pilot is an adrenaline junkie / Big Time Feeler’s dream; you’re excited and fearful and hopeful and nostalgic for the immediate past when it’s done because there is a chance you might never see these people again. And it’s so gratifying to see to fruition the actions you imagined would follow the words you read SO many times during the audition process. I’m pretty sure I read those sides a total of 9 times. It’s crazy to me that the people I met during the pilot are the same people I’m so close with now. CHEESEBALL WARNING: I’m so grateful for this experience and knew even then that we were all going to be a part of something beautiful and special. Except the braces. The braces during the pilot were hella cheap and uncomfortable. Also they were my own, so I had to be responsible for them, as opposed to the makeup department now. Way too much responsibility for an actor as flighty as myself. ES: This was the first prominently-featured-Sue episode. I got my first tantrum-esque monologue, my first having-to-remember-a-monologue-for-a-scene-at-the-end-of-the-day-which-was-like-midnight experience. This was also the episode I realized how wonderful my affinity for schmaltz/touchy feely tendencies were juxtaposed against Neil’s aversion to affection. That week started the daily tradition – now four years going – of me hugging him every day and him grudgingly obliging. Only downside, my weeklong proximity to sausage and cheese ruined any chance of me enjoying sausage and cheese in the future. But it’s really not that bad, ‘cause, like, it’s sausage and cheese. ES: The world’s introduction to Sue’s – and my – expert dance skill. To be honest, I am kind of surprised I didn’t get a call from the Alvin Ailey Dance Company asking if I were available to tour with them or something. Also, I met Brooke Shields this week. It took me literally 6 hours of practicing to master the 4-step-barely-moving Kung Fu Fighting dance sequence. Also, Brooke Shields. ES: Once upon a time, I dreamed of getting paid to exhibit my thespian skill, act on ‘camer-uh,’ perhaps perform in a ‘Fil-m’ in Hollywood. Then, my dream came true, I became a Big Time Hollywood Television Star, and people decided my talents were best utilized dragging myself on crutches around a track in the mud, while being blasted with cold fake rain, pelted with grass balls, falling flat on my stomach and army crawling on wet cement. On repeat. For twelve hours. But all for the sweetest victory for a character I had grown to love. I think this might have actually been the best work experience of my career thus far. ES: I don’t actually remember the plot of this episode very well, and I don’t think Sue was heavily featured. But I will never forget the experience of being on that tiny, claustrophobic, hot, cramped airplane set for a 13+ hour day. It was pretty awful, but all five of us were together. We haven’t gotten many all-five-of-us-together-for-a-whole-day days in recent months. It’s kind of stupid how much I love my cast mates and crew. Also, there’s something beautiful about suffering in solidarity. 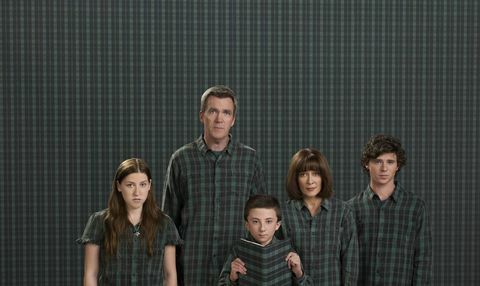 ES: The cold open of this episode was a 7-page scene of the whole family just sitting in the car talking. Much like my feelings towards ‘Hecks on a Plane,’ I will always remember that hot, crowded car with unique fondness. 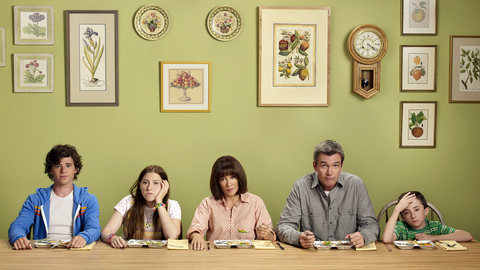 I also think that cold open turned out to be one of the best cold opens, and really best scenes, we’ve ever aired. I am also pretty sure this was the day we were introduced to Neil’s unparalleled Gary Busey / “Sling Blade” impressions. I am also pretty sure we all might have been mildly psychologically disturbed from the lack of oxygen in that car. Neil always hogs up all the oxygen. ES: LITTLE KNOWN INDUSTRY SECRET INSIDER SCOOP WARNING! Mike’s storyline in this episode, a cat he took care of at the quarry dies, was actually inspired by true events. Neil had taken to caring for a stray cat in his neighborhood – I’m not positive, but pretty sure that’s how he acquired this cat, I really only half-listen to sentences that don’t include my name – and earlier in the season the cat died. In fact, there is a line that I’m pretty sure was taken straight from Neil’s actual life. I think his sister told him that loving the cat humanized him, which Frankie also tells him. I just love everything about this whole everything. ES: I have nothing to say about this except: “Flawless Queen Whoopi Goldberg.” Okay that’s a lie I have just a little more to say. This episode might actually rival the Season 1 finale for greatest work experience. The magical two days I got to spend with Queen Goldberg are in my Top 5 Happiest Life Moments, second after my Bat Mitzvah, one above meeting Taylor Swift. I am crying typing this out right now, alone at my computer, reflecting on the experience. So, yeah, thanks for that. Ugh. Making a grown woman cry. Rude. ES: Okay, I spoke too soon about the Season 1 Finale for sure. The order for greatest work experience thus far goes as follows: 1. The Guidance Counselor, 2. The Friend, 3. Average Rules. Sorry, Average Rules, you’ll still always hold a special place in my heart, but make way for Whoopi and “Fame”! As exhausting as trudging around the track was, it doesn’t hold a candle to the two solid days I spent learning, practicing and perfecting the dance number the wrestlerettes performed in this episode. I treated this dance with an embarrassing amount of gravity. I was completely humorless in rehearsals, which only made for an even more mortifying reveal when I finally saw how it turned out. I loved every second of learning and doing this number. I am so happy not only that it was documented on film, and now a part of Primetime Television History, but also that I have a 45 second video of my friend, a fellow wrestlerette, secretly filming me watching a video on my phone of a 6 year old krumping and attempting to imitate everything he did. I spent a lot of time this week studying the Art of Krumping.